Paul Morphy went to Europe by way of Africa see note and returned by way of Persia. I was never more astonished by the appearance of anyone. Having formed my opinion of the man by the strength of his chess, I expected to see a tall, broad-shouldered individual, with a big beard and a ferocious expression. And there he turned out to be a slight, beardless, stripling youth in a broad-brimmed straw hat, a black tie and a meek and mild manner. I took him at once to the photographer, and had the portrait taken which is now in the Birmingham Chess Club. He was a very gentlemanly young fellow; no talker, and as it seemed to me, a player who performed all his wonderful feats by instinct and without visible effort. that they play some consultation games, pitting Owen and himself against Barnes and Morphy. Morphy and Barnes won the first game. The second game was begun, but not finished until nine days later at St. George's. In the interim the game had been analyzed deeply by Barnes, Owen, Boden and other players who declared it an inevitable draw. However, Morphy and Barnes won that game also. It's unknown whether any private games between Staunton and Morphy took place during that weekend, but some evidence seems to point to the possibility. Often played and wrote under the pseudonym Alter due to his profession. He was a close friend of Staunton and his manners towards Morphy, for whatever reason, were always loathsome, particularly considering his profession. spectators to believe that Morphy's reputation had been greatly overstated. 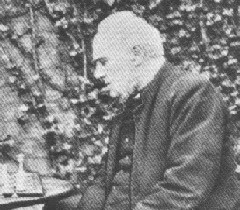 As the match progressed and as Morphy started to recover from the effects of his trip and from the illness that affected him when he first arrived, the balance shifted dramatically eventually giving Morphy 19 wins to Barnes' 7 wins. Barnes could boast of having the best results against Morphy than any other opponent. While waiting for Staunton's month of preparation to pass, Morphy visited all the London chess clubs but tended to gravitate toward Simpson's Grand Divan. 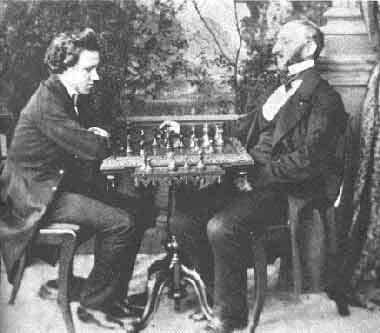 Although he made himself constantly available for chess and played casual games against most of London's strongest players (of which he considered Boden the strongest), Staunton always managed to elude him. On July 3, Morphy played a series of three games with Alter - John Owen. Owen won the first and Morphy won the final two. Later they played two more games which Morphy won. July 10 - Mr. Morphy has proffered to play Mr. Staunton a match of 21 games for a stake of 500 pounds a side, and the latter has accepted his challenge, conditionally that the terms of play are such as he can agree to without infraction of his present literary engagements. As there appears every disposition on the part of his opponent to meet his wishes in this respect the match will probably take place in London shortly after the Birmingham Meeting. Now that the match was postponed, yet again, Morphy accepted a challenge from John Löwenthal whom he had beaten in New Orleans when he was but 13 years old. The stakes were originally set at £50, but Löwenthal was confident, from Morphy's results with Barnes, that he had the advantage and asked to double them to £100. Morphy agreed and provided his own stake money. Somehow, Löwenthal's seconds were Barnes and Oldham while Morphy's seconds were Arthur Hay and John Owen. The winner was to be the first player to score 9 wins. After ten games, the score stood 7 to 2 (with the first game drawn) in Morphy's favor. Löwenthal took sick and Morphy insisted on postponing the rest of the match. When the match resumed a week later, Löwenthal won the first, one game was drawn, and Morphy won the other two he needed to win the match. Accepting the £100 stakes, Morphy bought a set of furniture valued at £120 and gave it to Löwenthal's family for their new apartment. Staunton has shown his willingness to play after the Birmingham meeting by allowing a committee to form in his favor at the St. George's, to raise funds to back him &c. but if Owen can make a match with Morphy at even, Staunton will be justified in saying: "I have made every preparation to play, but Mr. Morphy's procedure has prevented my doing so. Mr. Morphy plays Mr. Owen even, - I give Mr. Owen Pawn & Move. Mr. Morphy playing Mr. Owen even, must also accept Pawn & Move from me." Paul Morphy very properly will not consent to play him [Owen}, therefore, even. and Lord Arthur Hay backs him up in such determination. This nobleman, a splendid looking officer in the Queen's Guards, and a member of St. George's is much taken with Morphy and always comes to his assistance when such jealous devils as Owen & Co., are besetting him. You may rely on the match coming off with Staunton in September. The Rev. John Owen (alias "Alter") consented to play the match at Pawn & Move on Tuesday last; the terms being the winner of the first five games for a set of ivory Staunton Men. If Owen won, Morphy to play him afterwards even; if the contrary, Morphy to give him Pawn and two. Staunton gives Owen Pawn and one, and loses the majority of games, and the impression at St. George's was that no man living could give him these odds in a match. The first game Morphy won in 18 moves, time 2 1/2 hours, whereof Owen took 2 hours. The second game was drawn, after 6 hours play; the 3rd and 4th were won by Morphy, leaving Owen at Zero. This is considered Morphy's greatest performance since his arrival in Europe, and the folks at the St. George's believe now that Alter will not get a game. The match is resumed tomorrow when it will probably be finished. Morphy has not played anyone during the continuance of his match with the Hungarian. We have been constantly together, and have seen most the sights in London. I look particularly after his health, which I am happy to say is capitally good: his nerve is excellent, and I think he is at least a pawn and move stronger than when he played here at first, for he was somewhat fatigued from his voyage. Were it not for my position [religious leader] I would willingly play for £1000. Owen successfully avoided the second match at Pawn and two that he had consented to in the first match agreement.